In the 10th in a series of posts on 2017 books entered for The Story Prize, Tim Weed, author of A Field Guide to Murder & Fly Fishing (Green Writers Press), discusses eleven books that have inspired his writing. Which books inspired you the most? Which authors have been your role models? I’ve been surprised by how difficult questions of influence are to answer. Even easy questions such as, “What was the best book you read in the past year?” may cause an embarrassingly long silence as I rack my brain. Putting together an accurate top-ten life list would probably take me a week of thumbing through overstuffed bookshelves—likely supplemented by visits to various online book outfits for memory-jogging summaries and reviews. It’s just so hard to say. There are so many great works of fiction. It’s difficult to narrow the ones I’ve read down to a list of favorites—harder still to speculate about which authors have had the greatest influence over one’s work as a writer. I like the analogy of books as fossil fuel: lush vegetation trampled down in an ancient epoch only to bubble up years later in a spontaneous wellspring of newborn prose. Who can say whether that font of bubblin’ crude, that metamorphosed Texas tea, was once a royal palm or a tree fern? Looking back on these books, and thinking about the reasons they have stuck in my mind, I think of irresistible characters, high stakes, and immersive storyworlds. I think of Tolkien’s wondrous Middle Earth, of LeGuin’s bold reimagining of human sexual dynamics, and of the unforgettable sunlit intimacy of Renault’s mythohistorical vision. 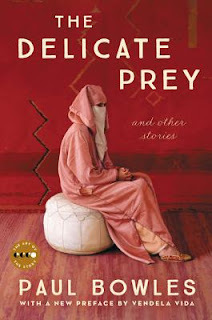 I think of the limpid, merciless clarity of Paul Bowles’ exotic tales, and of the storytelling genius of Robert Stone and Edith Wharton: the relentlessness of her ratcheting tension and the pitiless journeys their protagonists must undertake. I think of the profoundly affirmative versions of human consciousnesses passing through rich sensory worlds painted by Jim Harrison, John Cheever, and Larry McMurtry. And, especially with Cormac McCarthy and Peter Carey, I think of the sublime possibilities of language. Its sheer, terrible beauty. I note somewhat sheepishly, that only two of these books are story collections (three if you include novellas). The truth is, while as both a reader and a writer I love short fiction, I’ve been more influenced by novels, possibly because the form allows for a more profound immersion in the storyworld—or, if you prefer, for a more intense and long-lasting measure of escapism. I use the latter word intending none of the negative connotations often associated with it. The poet David Baker once said that all poetry can be divided into two categories, the ironic and the ecstatic. If we assume a continuum rather than a dichotomy, I think the same can be said of fiction. The Greek origin of the word ecstasy is “ekstasis,” meaning “to be or stand outside oneself.” Ecstasy is transcendent, implying a state of trance, vision, or dream. Irony, on the other end of the continuum, is social, worldly, and rooted in the intellect. Irony is essential in literature of course, as an antidote to sentimentality. But for me, the best-remembered fiction—the work that sticks with me long after I’ve put it down—is to be found on the ecstatic end of the continuum. The kind of story where one forgets all about those black marks on the page and enters the narrative as one would enter a trance, a vision, or a dream. At various times and in various ways, all of these authors have done that for me. It is a gift for which I owe them a lifetime of gratitude. And I hold out the cautious hope that I can, therefore, claim them as influences.